rough translation..."I WILL FORGIVE YOU DEAR IF I HAVE ANYTHING TO FORGIVE YOU DEAR I DONT THINK THERE IS DEAR I WISH WE WERE MARRIED DEAR DONT YOU"
Happy PFF. I like the format: you're an amazingly good talker and a pretty picture too. The card also seemed interesting. Maybe next time you can mix some images of the postcard itself in your video. Greetings from Amsterdam. I started to struggle through decoding it but thought to check if anyone else had, thank goodness, before I got too far. I'd love to know more. I liked the video and would like to see the postcard. Great find! Liked the link between your post and the video, one informing the other. Wonder how many people have seen Walt's message over the last hundred years, and now its on the internet panopticon. Pete - I can't believe you solved it that quick. Brilliant. Does this mean she's asked him for forgiveness in her last postcard? And such an emotional coded message makes the throughaway comment about the weather all the more strange, almost eerie. And please forgive me... I should have been more specific in the video. The stills of the card are at the bottom of the next post. If you click on the images they should come up in 7 megapixel beauty. Great video and very nice feature, at that. I really like the way you explained and featured this great postcard. 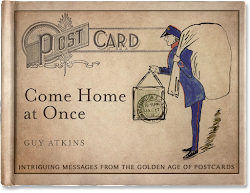 There's nothing better than a postcard that REALLY tells a good story. I hope to see more videos in the future. Great job!